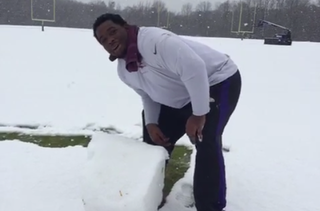 Florida-born Timmy Jernigan had never seen snow up close until Wednesday, so after the Ravens finished practice, he enjoyed a new life experience. Snow! (He'll get sick of it soon enough.) Jernigan was having so much fun that he ended up being late for a defensive meeting. While Jernigan worked on a snowman, he was unaware that his meeting had been bumped up half an hour.